Boys dressed as devils wearing bright red masks teamed with black and golden capes danced in circles with girls sporting red, white and golden sequined outfits in one act. In another, clowns in multicoloured suits and matching wigs spun hula hoops. And in a nod to Bolivian countryside carnival traditions, girls in traditional puffed skirts and lace blouses wore balloons and streamers wrapped around their necks as they danced with their hands on their hips before mischievously throwing brightly coloured confetti over their headteacher. 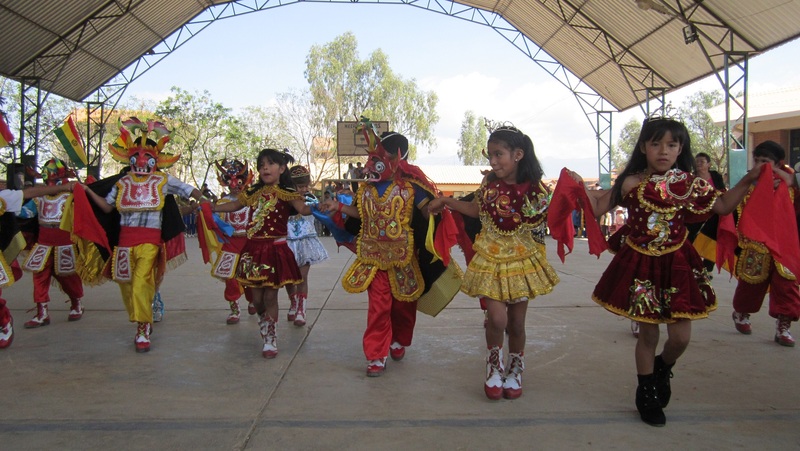 Around 850 students aged between 5 and 18 took part in the annual festival of music and physical education at René Barrientos Ortuño School on the outskirts of Cochabamba on November 20. The children showcased dances from around Bolivia, a selection of traditional music and a dazzling array of costumes. During one performance boys wore white tunics with multicoloured plumes of feathers on their heads and in another they donned embroidered black and pink outfits with bells on their shoes. Girls also ensured there was plenty of colour on the dance floor, wearing luminescent orange and yellow skirts paired with bright green tassels hanging from the end of their plaits in one act and silky red and green ruffled dresses in another. Highlights included a musical performance involving Andean panpipes, a dance routine in which boys armed with fake saws cut down classmates dressed as trees to warn against deforestation, and a daring human pyramid formed of more than 20 students balancing on chairs, ladders and each other. School Director Adolfo Mamani Riquez said the festival was a chance for the students to show their parents and peers the dancing and gymnastic skills they had picked up in physical education lessons during the course of the year.